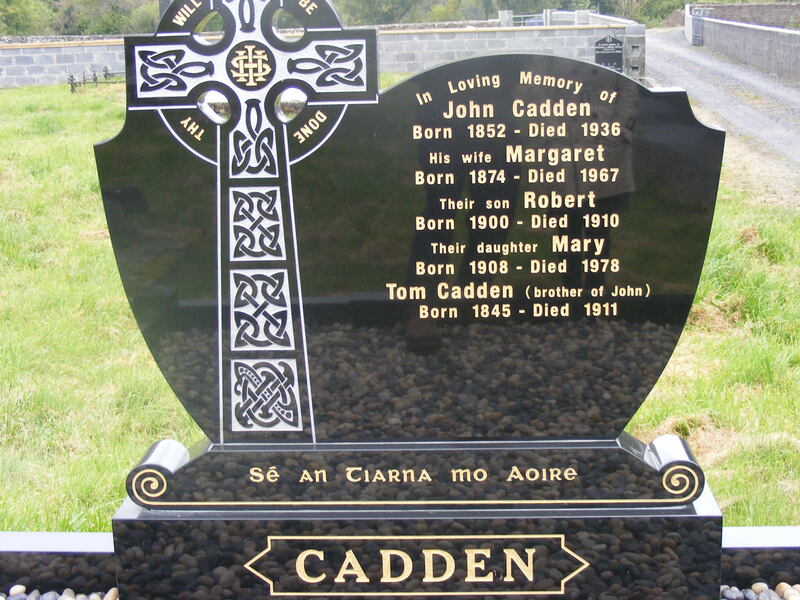 Tom Cadden was born in Ballyscanlon, Crossmolina on 16th November 1845, he was the first child of Robert Cadden and Biddy Heffron. Two sisters Mary in 1850 and Bridget in December 1851 were also born in Ballyscanlon. 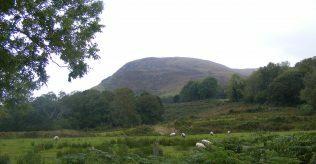 The family were evicted in 1852 and moved to a 70 acre mountain farm in Kilhale, Glenisland, Castlebar about 25 miles away. About 1865 Robert gave up approx. 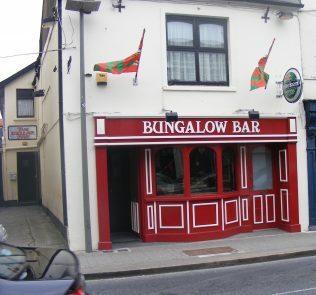 half the holding in Kilhale and took a similar amount of land in the adjacent townland of Monagarraun with a house which was on the side of the old Castlebar to Belmullet road. We have no details of Tom’s schooling but he could read and write English and Irish as could his younger brother John and a number of his contemporaries. At the time, the teaching of Irish was discouraged. We have no idea who taught in the school or where the school was located in Glenisland. It was said locally that Tom spent some time in the United States but there are no emigration records to prove it. Two of his brothers Robert and Patrick were in Iowa two sisters Margaret and another sister whose first name we have not been able to find were also in the United States. Tom was 50 years old and may have been a returned yank when he married Jane McGoldrick on 16th of June 1895. 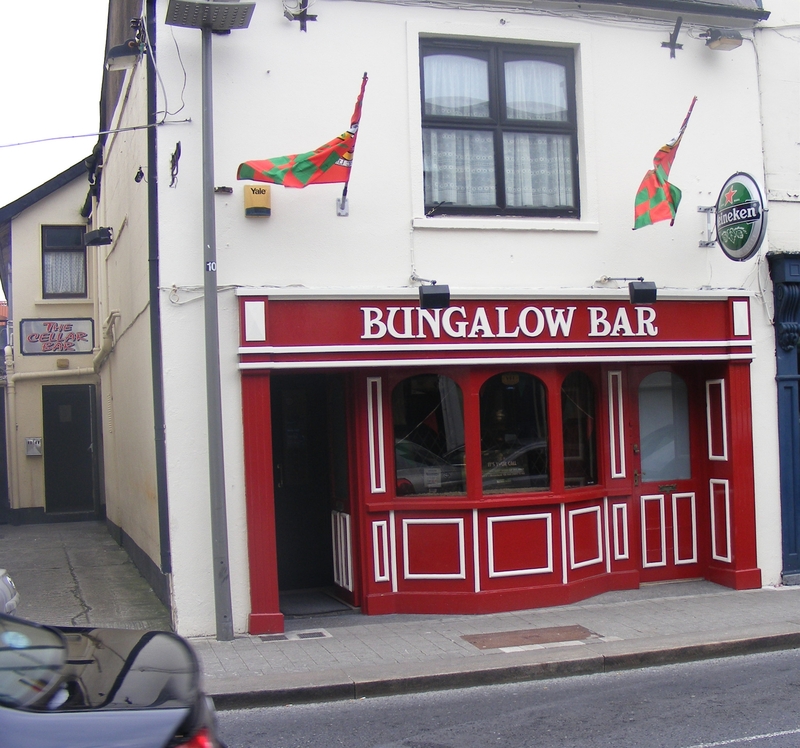 She was a widow and had a pub the Bungalow Bar on Main St Castlebar. Her maiden name was O’ Connor. Tom was described as a cattle dealer on his marriage cert. They had no family. After he married he took over the bar licence. Before the bacon factory in Castlebar was built there was a regular pig fair on the 17th of November in Castlebar. In those days pigs were reared outside and they were well used to walking. The Glenisland people walked their pigs to Castlebar the day before the fair. The pigs were yarded behind the Bungalow Bar that night; their owners played cards or drank in the bar while they waited for the fair to start in the morning. There is no record of Tom being involved in community affairs until he moved to Castlebar. The 1890’s was a time of the Gaelic revival. Tom was a member of the Gaelic League whose aim was to promote the Irish language. 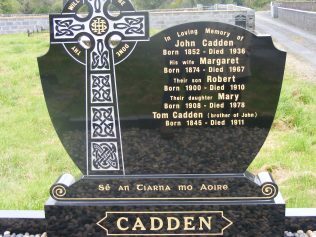 He was a very active member who took the promotion of Irish very seriously, on one occasion he was a member of a coroner’s jury and he signed his name in Irish Tomás Ó Cadhgín instead of Thomas Cadden which apparently was not legal at the time. The coroner informed the juror that there was “a little bit of law” about signing names which he would like to read to him. The juror expressed the opinion that Irish was the language of Ireland and that it had for too long been dormant and that it was high time it was raised up. The coroner was upset and pleaded with him to sign in English but Tom persisted and the Irish signature was accepted. He was also very active in the United Irish League which was formed in Jan. 1898. This became a huge organisation with 462 branches and a membership of 60,000. The aim of the United Irish League was to speed up the division of landlords estates and the huge grazing farms. They held large meetings to encourage the grazier tenants to give up their leases and pressurise the landlords to sell to the Congested Districts Board. The United Irish League did not become involved in illegal activities; their policy was to stay just inside the law. They were often involved in scuffles with the RIC over cattle drives and the sale of impounded cattle. The RIC were observers at many of their meetings but Tom seemed to be able to keep within the law. Tom walked to most of those meetings which were within five or six miles of Castlebar. The United Irish League was very closely associated with the Irish Parliamentary Party and Tom campaigned for their candidates at election time. As he died in 1911 we will never know how he would have reacted to the challenge of Sinn Fein to the Irish Parliamentary party in the 1918 election. Tom was the first secretary of the Castlebar Home League when it was formed in 1901. This organisation campaigned to improve the condition of tenants in towns; the local landlords generally owned many houses in the towns. 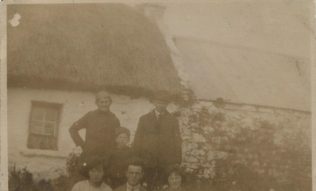 In the early 1900’s Tom became a rate collector for the District Electoral Division of Croaghmoyle; his home area in Glenisland, he resigned in 1906 and was later appointed rate collector for Ballyvary area a post held when he died in 1911. He died unexpectedly on 16th of June 1911 aged 65 years and was buried in the Family plot in Glenisland cemetery. His obituary said he had poetry published in Irish and English. The attached poem Scenes of Glenisland was published in the Connaught Telegraph 23rd Oct. 1897. Whilst researching my family I came across this. Would this be your family?